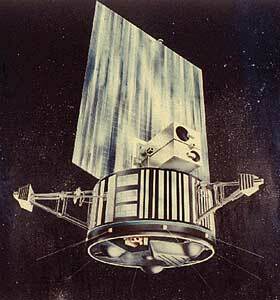 The objectives of the OSO (Orbital Solar Observatory) satellite series were to perform solar physics experiments above the atmosphere during a complete solar cycle and to map the entire celestial sphere for direction and intensity of UV light, X-ray radiation, and gamma-ray radiation. The OSO 8 platform consisted of a sail section, which pointed two experiments continually toward the sun, and a wheel section, which spun about an axis perpendicular to the pointing direction of the sail and carried five experiments. Gas jets and a magnetic torquing coil performed attitude adjustment. Pointing control permitted the pointed experiments to scan the region of the solar disk in a 40- by 40-arc-min to 60- by 60-arc-min raster pattern. In addition, the pointed section was capable of being commanded to select and scan a 1- by 1-arc-min or 5- by 5-arc-min region anywhere on the solar disk. The spacecraft had a mission life of more than a year, but exceeded that by transmitting data until Sept. 26, 1978, outliving all other OSOs by at least six months.